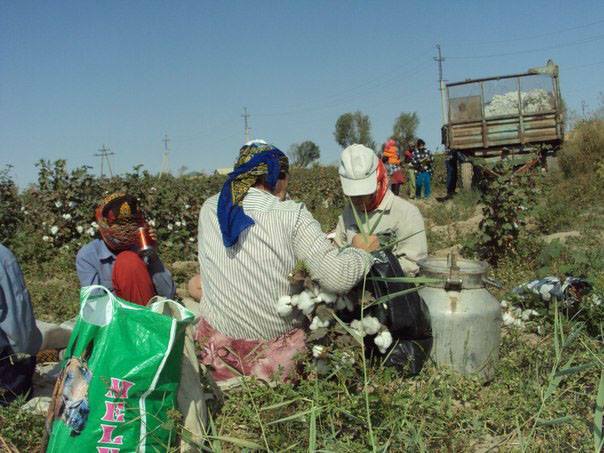 The harvesting of cotton has always been a major part of Turkmenistan’s agricultural sector of economy. When Turkmenistan was part of the Soviet Union, cotton fields comprised 85-90 percent of all of agricultural land, the rest having been allocated to grains, vegetables, gardens, vineyards and animal feed. Despite the extensive measures taken to develop the cotton sector to increase productivity, the final output of raw cotton remained constant throughout the years – less than one million ton per year. And, even this result was achieved entirely due to colossal additional expenses and the expansion of the planted area. More generally, the output was always exaggerated, both during the Soviet period and during the era of President Saparmurat Niyazov. For example, in 1986 the official announcement stated that 1 million 137 thousand ton of cotton was picked that year, however that same year saw a series of lawsuits in a big cotton-growing region, where several high ranking officials (party leaders and agricultural directors) were charged with fraud and attempts to embellish the amount of cotton harvested. According to specialists in the agricultural sector, both during the Soviet period and after, the volumes of cotton harvested were, in fact, doubled on paper. More precisely, to every ton of cotton actually picked statisticians added another ton, all done under the pressure from the regional governments and with tacit agreement from the government of the republic and, later, the national government. Essentially, cotton that did not in fact exist was added to the real numbers. 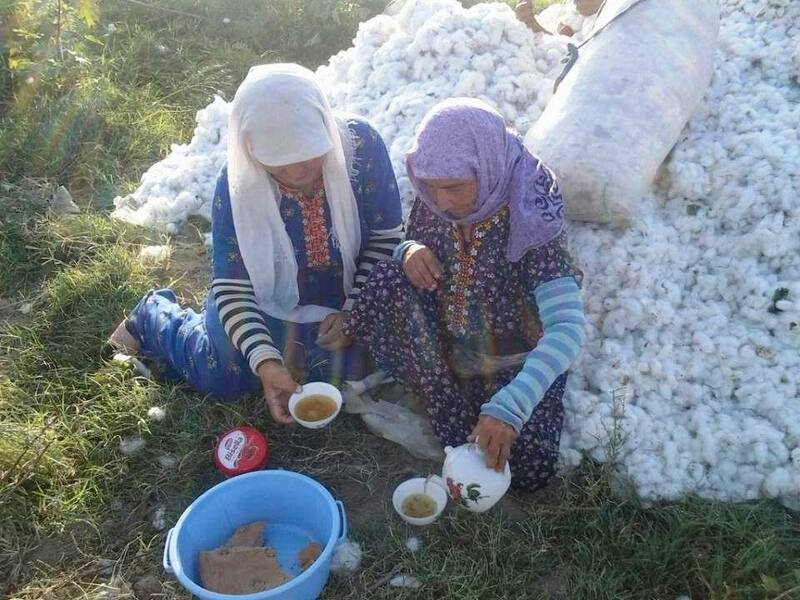 For instance, in 2005 Saparmurat Turkmenbashi demanded that the cotton production be increased to 2 million ton and in 2005 – to 2.2 million ton, however throughout those years the actual cotton production did not rise above one third of what was planned. In 2005, for example, the Minister of Agriculture of Turkmenistan announced that 723 thousand ton of cotton were picked, whereas according to independent experts, one half of this amount was simply made up. With President Berdymukhamedov the exaggeration of the amount of cotton harvested has gone down significantly and, as land lessees and directors of “dayhan communions” (what used to be called kolhoz) have admitted, the plans have become much more attuned to what the soil can actually produce. Our sources in “Turkmen Cotton” say that the numbers are still often exaggerated in practice, even if to a lesser extent. According to them, in 2012, the best year for cotton in years, from an area of 550,000 hectares 1.1 million ton of cotton was picked. The plan for the area was 1.5 million ton. Thus, experts think that in 2012 the volume of made-up cotton was about 100,000-150,000 ton. — low technical skill of those who use and maintain the equipment (improper use, poor maintenance, frequent breakdown of expensive equipment). Currently, the amount of harvesting done using the combines is not publically unnoticed, however specialists estimate that it does not exceed 10-12 percent of total volume of cotton harvested in the country. Both in Soviet times and in the years of independence mechanical cotton harvesting by combines was only properly functioning on model farmlands, which could be found in every region and were given special support by distinct budgetary allocations and personal support by the republic head or the president. Examples of such model farmlands are: former “Soviet Turkmenistan” kolhoz (chair – Muratberdy Sopyev) in the Ahal region; former “40 Years TSSR” kolhoz (chair – Sadulla Rozmetov) in Dashoguz region, which was later turned into an independent company by the name of Rozmetov, etc. The main responsibility for cotton harvesting has always fallen on the shoulders of farmers, who were first kolhoz-employees, then free laborers, then lessees of land and on the shoulders of workers from the regions. In the sixties, seventies and eighties, the entire adult population of the country was mobilized for harvesting. The cotton season (September through November) essentially paralyzed life in the country. In the seventies even the universities and technical colleges would close for the period and students would be taken to the fields by train. The residents of the regions were in a worse position. All public schools closed for the cotton season. Only children in the first through fourth grades continued to study, but even in their case, some were sent to the nearby fields after the school day was over. Students of village schools from the fifth through tenth grades went to the fields on foot, while students of regional schools were brought to the fields in trucks and trailers attached to tractors. Children were brought to the fields for an entire day. They were picked up at 7:30 in the morning by their schools. By 8 they were already in the fields. Food was not provided for them, so each ate whatever he brought with from home. They only thing provided for children was boiling water to be used to make tea for lunch. The tea itself, however, children had to bring from home. They also brought their own drinking water, however much of it they could carry. On particularly hot days they drank whatever water they found near-by. Children returned home after dark and this happened every day, until the very last day of the cotton season, until the last bit of cotton that still remained to be picked was gone. 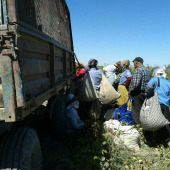 In 2008 Berdymukhamedov legally forbade the forced labor of children and university students in the agricultural sector and demanded that those violating the law be persecuted. Since then, in the last 5 years, children no longer harvest cotton. That does not mean, however, that child labor is no longer used in the fall season. In the countryside, outside the city-centers, there are still children in the cotton fields. Some go voluntarily in order to get some money. Others go in place of their parents, who are forced by their employers to either go to the fields, or hire a worker to work in place of them, covering his salary, food and shelter expenses. Thus, although the numbers have gone down significantly since the Soviet period and the period of Niyazov, children are still used in harvesting cotton. Today we would like to share some facts, figures and details of this year’s cotton campaign. The information has been gathered by our readers — the actual participants of the current campaign, located in different regions of the country. As is well known, every year, all employees of the social services sector are forced to harvest cotton under the threat of being fired. Tens of thousands of teachers, doctors, mailmen, bank, factory and other industrial employees throughout the country are forced to stop their work and join the battle for the harvest. For example, on August 30, 500 employees of a regional hospital were taken to the fields; those sent to the fields were the medical staff finished with their shift, nurses and medical assistants. 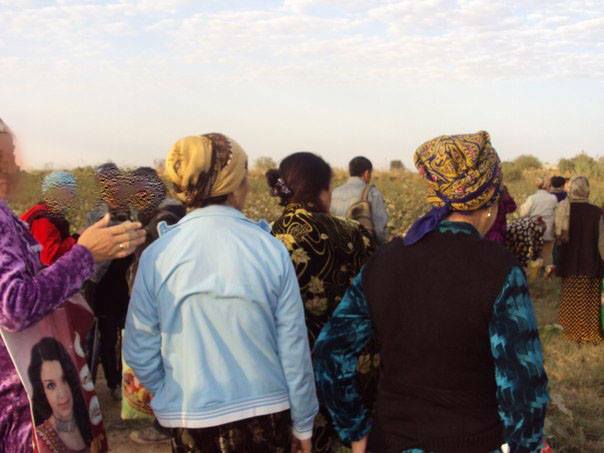 The regional government of Dashoguz ordered the principles of all 25 public schools to mobilize 800 individuals for cotton harvesting. The same number of people was gathered by the principles of kindergartens. The teachers and the doctors do not protest openly because their superiors tell them that their refusal to pick cotton will result in immediate firing and replacement with other workers. This, of course, directly violates Article 2 of ILO Convention on forced or compulsory labor, which defines forced labor as “all work or service which is exacted from any person under the menace of any penalty and for which the said person has not offered himself voluntarily.” Forced labor on the cotton fields also violates the labor law of Turkmenistan. First to be sent off to the fields are the facilities staff: gardeners, security and cleaning personnel. In peak season school teachers and kindergarten teachers are sent to the fields as well. Some school principals send to the fields even those teachers, who teach children in the mornings; the teacher works in school in the morning, and then goes off to the fields in the afternoon. Sometimes people return home at 9 in the evening, especially those, who live outside the cities, and then, the next morning, they have to be ready to return back to the field. The principles of schools do not seem to care if people have families, children and tasks to be done at home. Truth is that the principles of schools are under a lot of pressure themselves. Every day they are asked to appear at the meetings of the municipal departments of education of the Dashoguz and Lebap region. During these meetings the principles are literally scolded for not harvesting enough cotton or for not sending enough people out to the fields. The principles, in turn, take their frustration out on the teachers. Every morning, before the buses take off for the fields, inspectors from the municipal department of education do a repetitive head count, checking off every last name on the list. Sometimes, amusing stories happen. 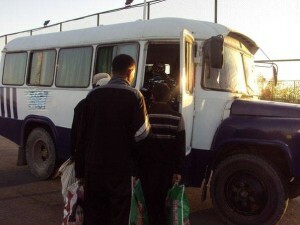 Once, employees of the Lebap region decided not to get off the bus when they arrived to the field and returned right back to the city. The inspectors arrived to the field and did not find a single employee there. They reprimanded the principles, and those, in turn, scolded the employees. Every organization, on a daily basis, has to present a report on the amount of cotton picked based on a 50 kg per person quota. Not everyone is able to pick this much cotton and at times there are fields where no cotton grows. The report, nevertheless, has to be prepared daily. Starting on September 16, doctors from Lebap began to be sent to the fields of Sayat for 5-day shifts with overnights. Service workers from Turkmenabat also go out to the fields with overnights, but for longer periods of time. For instance, 150 employees of house management department were sent to the fields of Yilangyz. They slept on mattresses they brought from home, placed directly on the floor of a school gym. They were offered a meal only once a day, in the evening, and the meal itself was worse than what is usually served to the prisoners in state prisons. No one could eat such food and people either chose to eat what they had brought from home or went to the small local shop to buy something. The prices at this local store were three times higher than those at the city stores. There were many snakes in the area and some people caught and cooked them for dinner. The same water was used for drinking as was for showering. The evenings were very cold and many returned home with the flu. The majority of people feed on whatever they bring from home. They usually sit on their blankets and aprons in groups of 5 or 6. They are given one hour for lunch. Water and sometimes hot tea is provided by the lessees of land. Some bring water in buckets directly to the field. In this sense, one’s luck depends on what lessee of land one is working under: some bring water from the local well and others might even offer the fruits and vegetables from their own gardens. At the end of August, one person was expected to pick 20 kg of cotton per day. Now, in mid-September, the quota has gone up to 50 kg per person. Those who do not want to go out to the fields or cannot do so for some reason, have to send someone to replace them. Usually, replacement is found among workers for hire – those, who do not have stable jobs and often look forward to the cotton season which offers them an opportunity to make some money. It is hard to say whether there are more men or women among them, but there are certainly some children among them, who should have been in school on weekdays. If a person is hiring someone else to do his cotton harvesting, then he himself must report to work as usual. If he is going to the field himself, then he retains his salary. Last year, hired workers were paid 5 manat (less than $2) per day and this year the fee ranges from 7-10 manat, depending on an individual agreement. However, the major source of income of hired workers does not come from the daily fee, but from the payment for the cotton they pick. For every kg of cotton lessees of land pay the workers 20 tenge (7 cents), thus the workers are motivated to work hard and are able to collect up to 120 kg per day. Some land lessees try to cheat. In the presence of an inspector from a local institution the cotton harvested may be weighted at 15-20 kg (two aprons filled with cotton), however once the inspector leaves, the same cotton can be said to weigh only 12 kg. Sometimes people argue over such unfairness and some are able to get justice and have their cotton weighted fairly. For demanding fair treatment land lessees call such people “beggars” who “come this far in order to argue over pennies”. The lessees claim they too have their total-gathered cotton weighted unfairly, but they do not argue about it. On September 9th in Lebap kolhoz (former-Zhdanov kolhoz) of Serdarabat region, the employees of a clinic in Turkmenabat were refused pay and were told that their director will, supposedly, pay them the following day. The employees expressed their dissatisfaction and threatened to file a complaint. Finally, in both cases the workers were paid in full on the same day. People are taken to the fields and back by public transportation. These buses are taken from their regularly-scheduled routes, which, in turn, creates many problems for those not engaged in cotton harvesting. 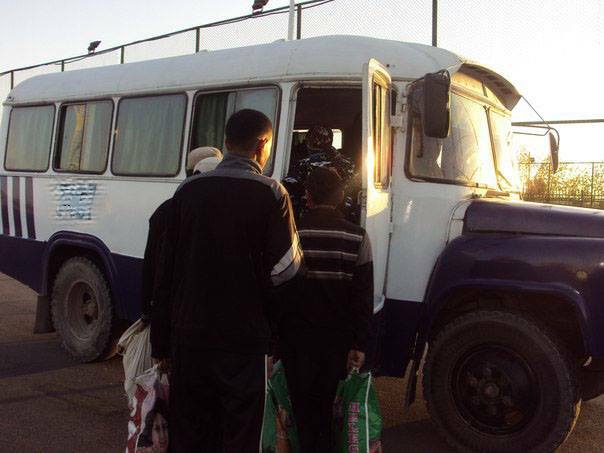 In Dashoguz region even private mini-buses are rerouted and are not allowed to return to their regular work until they take people to the fields. There are several pickup spots throughout the city, which are usually located by large factories, etc. For instance, medical workers in Turkmenabat are picked up by the regional hospital, while the teachers — by school number 30 in Uchpunkt neighborhood. 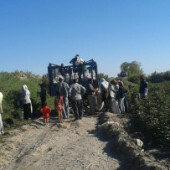 At the beginning of September, in Garabekevul region (70 km from the regional center), there was an accident with a bus that was headed to the fields; the bus was overcrowded as those managing the workers attempted to crowd as many people as possible into a single bus. Since this accident, the number of people on each bus is strictly monitored and the maximum number of people allowed on a bus is equal to the number of seats on the bus. There is strict control over this from the side of road police. Unfortunately, we were not able to get more details on the accident, but we do know that several people were injured. It is not a rear situation when the bus that is to take people back to the cities does not arrive until 8 in the evening and people are forced to work until dark. On September 21 the medical staff from Turkmenabat was left out on the field because the bus meant to take them home never arrived. Some returned home by taxi, some were picked-up by family members and others found other means to return home. All of them came to their homes late at night.